Recently, one of my friends Piyush ‘Jayant’ Arora published his poetry’s book. The title of the book is Rang Leela. I told him that I rarely read poetry out of my educational requirements. The title seems interesting I would like to read it. I got a copy this week. So, I started reading it from cover. This was the first time I was reading a poet whom I can imagine as an individual. When I read Dharamvir Bharati (Andha yug) or Ramdhari Singh Dinkar (Kurukshetra), I always felt poets are super humans from a different world. Piyush is like me – he has done his engineering and an MBA. So I can think of a a human [not a super human writing]. The first thing I read in his book was back page cover. [Translation] Life is all about our perspective and we all see it with our own lens. Our experiences and interactions fill in the color of the canvas of our lives. When I was reading the good small poems I wrote to him about referring to some in my blogs. He readily agreed. This week’s LBC (Loose Bloggers Consortium) title perfectly matches with Piyush’s perspective. और सब कुछ होता सिर्फ़ गोरा या काला..
तो क्या अब तक बह रही होती यह धारा? [English – my words] If truth has always been triumphant over false… and everything is completely black and white… had there been a flow of different perspectives? This topic was suggested by Maria, for the weekly Friday Loose Bloggers Consortium where currently nine of us write on the same topic every Friday. I hope that you enjoyed my contribution to that effort. The seven other bloggers who write regularly are, in alphabetical order, Ashok, gaelikaa, Lin, Maxi, Padmum, Ramana Uncleji, Shackman and The Old Fossil. Do drop in on their blogs and see what their take is on this week’s topic. Since some of them may post late, or not at all this week, do give some allowance for that too! I read this story in a book. A father once gave his son a telescope. One day the boy was using the telescope, he was little disappointed with the performance, he went to his father and said “father it is useless, I can see better without it. Everything is too small.” Father smiled, the boy was looking from the wrong side, he was not getting the BIG PICTURE at all. The boy had a narrow outlook through the glass. The father turned the little telescope around. The father had widened the son’s outlook. The boy grew up and improved the primitive telescope and with it discovered the moons of Jupiter, the rings of Saturn and the Mountains on our moon. The boy was Galileo. A king has the blind men of the capital brought to the palace, where an elephant is brought in and they are asked to describe it.”When the blind men had each felt a part of the elephant, the king went to each of them and said to each: ‘Well, blind man, have you seen the elephant? 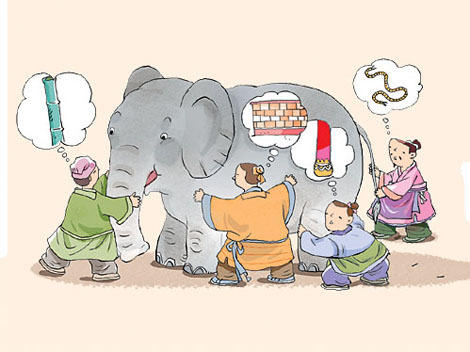 Tell me, what sort of thing is an elephant?” The men assert the elephant is either like a pot (the blind man who felt the elephants’ head), a winnowing basket (ear), a plowshare (tusk), a plow (trunk), a granary (body), a pillar (foot), a mortar (back), a pestle (tail) or a brush (tip of the tail). on spirituality The Elephant And The Blind Men, Finding The Oneness Of God And Man you can check these books if you want to read them.